"Everything you've heard about me is true." The Millennium Falcon may be best known as the ship that completed the Kessel Run in twelve parsecs (if you round down), but that’s not its only claim to fame. Before Han Solo ever touched the ship's controls, Lando Calrissian had already used the Falcon to build a reputation as one of the best smugglers in the Star Wars galaxy and, with the upcoming release of the Lando's Millennium Falcon Expansion Pack, Scum and Villainy players will have the opportunity to experience the less than savory exploits of this iconic ship in their X-Wing™ Second Edition squadrons. Join us today as we take a closer look inside the Lando’s Millennium Falcon Expansion Pack! Although it was originally built as a light freighter, the Millennium Falcon has seen its share of combat. From participating in the attacks on both Death Stars to drawing the First Order’s squadrons of TIE fighters away from the Resistance forces on Crait, the Falcon is more than capable of holding its own in a fight. 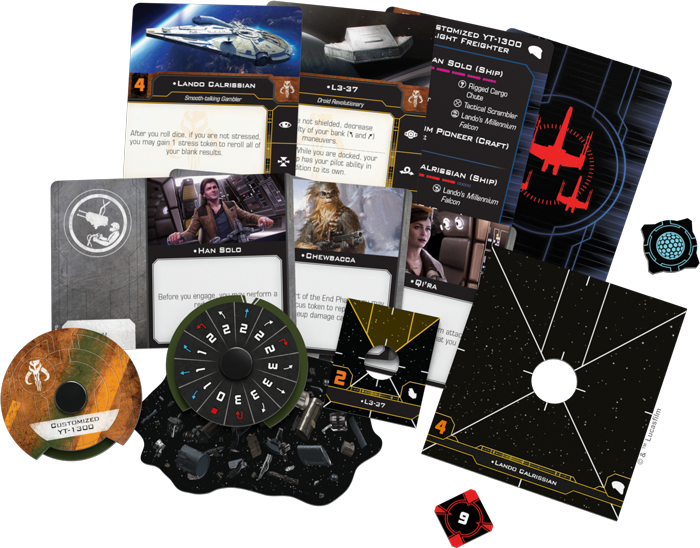 The ship is the first in X-Wing Second Edition to feature a double turret arc, allowing you to fire at anything that approaches—as long as you’ve rotated your arcs into the correct position. Of course, having one of the best pilots in the galaxy also helps. As we saw during the legendary Kessel Run in Solo: A Star Wars Story, Han Solo excels at flying through debris fields. 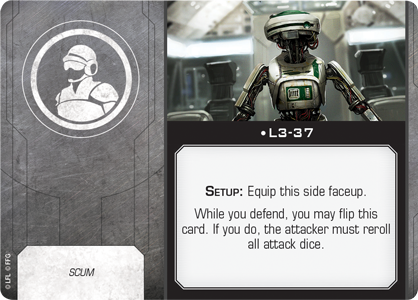 In X-Wing Second Edition, obstacles only serve to enhance his abilities. 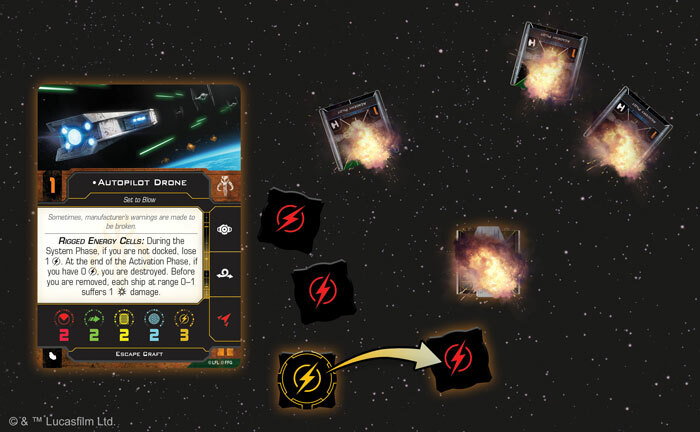 While performing a primary attack or defending, Solo can roll an additional die if the attack is obstructed by an obstacle, encouraging him to put asteroids and debris fields between himself and enemy ships as much as possible. But Han Solo can’t take all the credit for the Falcon's recording-breaking run. He was only able to complete his run thanks to the navigational prowess of the droid L3-37. The Lando’s Millennium Falcon Expansion Pack gives you several ways to include Calrissian’s trusted co-pilot in your squadron. 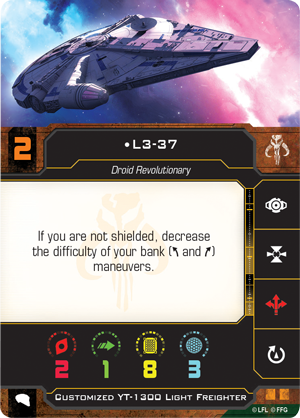 You could put her in the Falcon’s pilot seat, using her skills as a navigator to decrease the difficulty of your banks while you are not shielded. Alternatively, you could have her join the crew of any of your Scum ships with an available crew slot. If you do, she can force a ship attacking you to reroll all their attack dice before integrating with her ship and giving it the same navigational boost she gives the Falcon while she's piloting it. 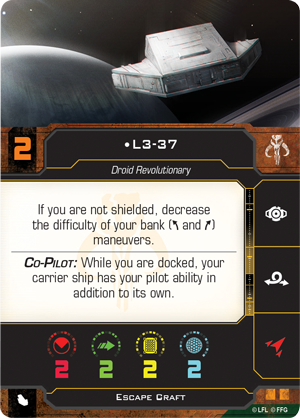 As L3-37 demonstrates, having a competent co-pilot on board a ship like the Millennium Falcon can give you a major advantage, and you’ll find plenty of options for filling the Falcon’s two crew slots in this expansion. 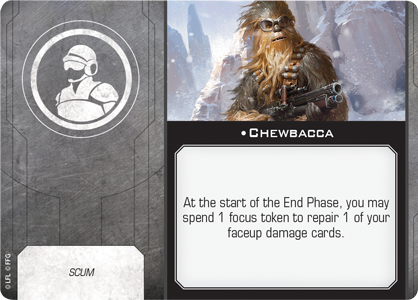 For example, Chewbacca has always been skilled at maintaining the Falcon on the fly, and in X-Wing Second Edition, he helps mitigate the effects of your faceup damage cards by letting you spend a focus token to repair one of those cards at the end of each round. 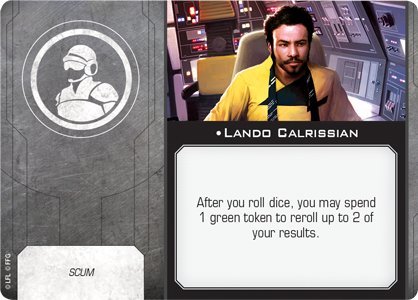 Meanwhile, Lando Calrissian's taste for gambling carries over to his crew card, giving you the ability to spend any green token to reroll up to two of your results. Still other crew members can open up new options for maneuvering your ships into the perfect position. 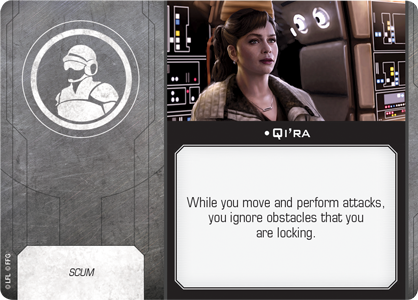 Qi'ra in particular syncs well with Han Solo’s pilot ability. 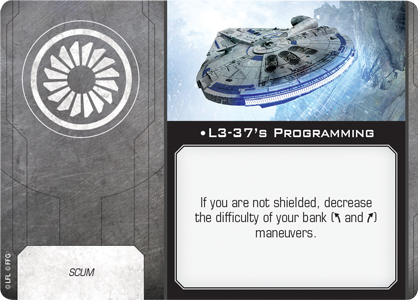 In X-Wing Second Edition, ships can acquire locks on objects in addition to ships, and with Han flying and Qi’ra as a crew member, this can provide multiple benefits. 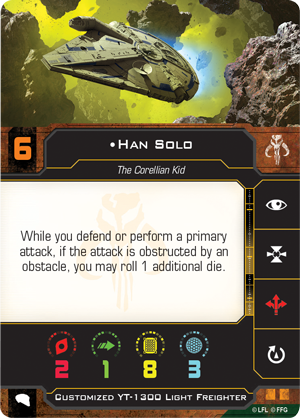 Together, they let you fly right through any obstacles you're locking and gain the extra die from Han's ability when firing through those same obstacles—without also granting an extra defense die to your target. Although both Han Solo and Lando Calrissian are skilled smugglers confident in their own abilities, they have wildly different styles when it comes to being the captain of the Millennium Falcon. One of the most visible of these differences is the Escape Craft that Calrissian kept docked in the nose of the Falcon while he owned the ship. In the Lando’s Millennium Falcon Expansion Pack, this craft forms its own miniature that can be flown on its own or docked with the ship for even more tactical options. 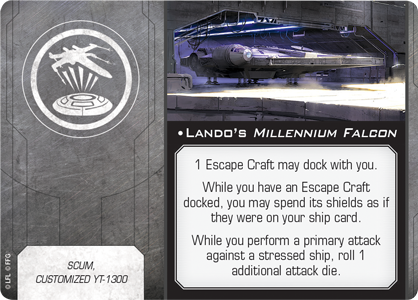 If you have the Lando's Millennium Falcon title equipped, the Falcon and the Escape Craft can operate as one, giving the Falcon access to the Escape Craft’s pilot ability in addition to its own. 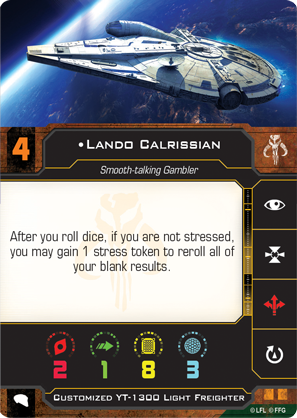 You might use this to pair L3-37 with Lando Calrissian and give yourself plenty of ways to get rid of the stress tokens Lando is sure to accrue. 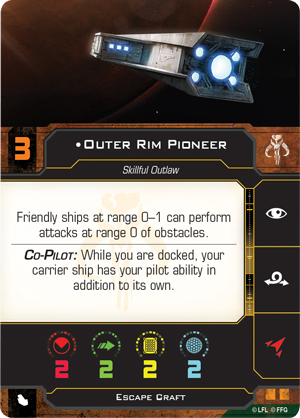 Similarly, an Outer Rim Pioneer works equally well docked with the Falcon or on their own, letting friendly ships at Range 0–1 perform attacks even while they are on top of obstacles. 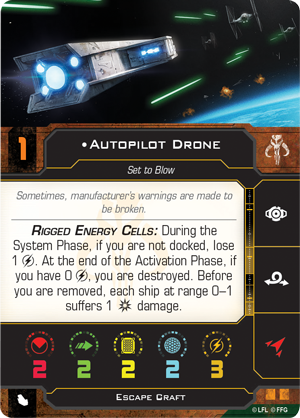 The Autopilot Drone loses its last charge and explodes, doing one critical damage to every ship within Range 0–1! In addition to sharing pilot abilities, a docked Escape Craft gives you two extra shields to spend as if they were on the Millennium Falcon’s ship card. This extra layer of defense is nice, but you might want to save the Escape Craft’s shields for when it’s flying on its own, especially if it’s being operated by an Autopilot Drone and carrying a load of rigged energy cells. This ship is set to blow and do massive damage to any nearby ship after three rounds, but it’ll need all of its shields if it’s going to survive that long. The Millennium Falcon has a storied history, taking part in events that have shaped the galaxy. But long before she was a part of the Rebel Alliance, the Falcon became infamous for making daring smuggling runs across the Outer Rim. Experience this history with the Lando's Millennium Falcon Expansion Pack! 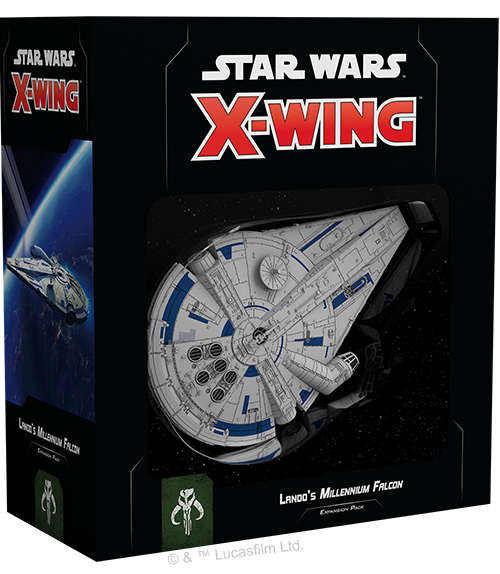 Look for the Lando’s Millennium Falcon Expansion Pack (SWZ04) to release alongside the X-Wing Second Edition Core Set on September 13th, 2018. Pre-order your copy at your local retailer or online through our website today!